Just like that, the hectic holiday season is behind us and we are into 2019. We spent our Christmas at my brother’s house, so we did not host either Thanksgiving or Christmas in 2018. It always feels odd to me when I do not end up cooking much at the holidays, and my only real contribution to Christmas dinner was a batch of roasted Brussels sprouts. We had great food, though, including a salty Wayco ham. I always have a long list of things I want to cook/bake that are unrelated to this blog project. I plan to actually sit down and make a list of the top things I want to make this year, so I can physically cross them off as I complete them. I had planned to make my list yesterday since it was the first day of the year, but I spent the day with a fever on the couch instead. Boo. The 115th episode of Good Eats is one that Alton chose to remake in his new show Good Eats: Reloaded. Savory polenta is the first recipe in this one. So, what is the difference between grits and polenta? According to Alton, grits and polenta are different preparations of the same main ingredient: cornmeal. Grits are often made from ground hominy, which is white, while polenta is made from ground yellow corn. Either way, when purchasing cornmeal to use in either grits or polenta, always look for stone ground cornmeal; the terms “polenta” and “grits” are often featured together on the label of stone ground cornmeal. To make polenta, place 2 T olive oil in a saucier over medium heat. Add 3/4 C chopped red onion and 1 1/2 t Kosher salt, and cook the onion until it has softened. Red onion and Kosher salt added to saucier with olive oil. Add 2 cloves of minced garlic and cook for two minutes. Next, add a quart of chicken broth and bring the broth to a boil over high heat. Chicken broth added to the pan. Chicken broth added to the pan and brought to a boil. When the broth is boiling, gradually add 1 C coarse cornmeal, whisking it in. Once all of the cornmeal has been added, place a lid on the pan and place it in a 350 degree oven for 40 minutes, stirring the polenta every 10 minutes. Polenta placed in the oven for 40 minutes. Remove the pan from the oven and stir in 3 T butter, 2 ounces grated Parmesan, and 1/4 t pepper. You can now eat the polenta as it is or you can pour the warm polenta into a parchment-lined 9×13″ pan. Let the polenta cool to room temperature in the pan, and then place it in the refrigerator for 1-2 hours. Polenta poured into 9×13 pan. After chilling, flip the polenta out onto a cutting board and use a biscuit cutter to cut rounds. Cooled polenta flipped onto cutting board. Toss the polenta circles in olive oil and you can fry, saute, or grill them; I opted for sautéing. I served my polenta with a homemade tomato sauce and some grated Parmesan. Polenta rounds with tomato sauce and Parmesan. This polenta is easy and delicious. We tasted the polenta after adding the butter, cheese, and pepper, and I would have been content to eat a bowl just like that. I also liked the sautéed version, as there was a slight golden crust on the outside, while the polenta remained tender and buttery on the inside. The garlic and onion flavors were obvious and made the polenta savory with a little kick. This would also be a great vegetarian dinner option if you substituted vegetable broth for the chicken broth, and this seems like a very kid-friendly dinner option too. Don’t bother with that tube of polenta at the grocery store when you can make this version at home! I first remember having grits when I was in the Florida Keys for my cousin’s wedding. We stopped for breakfast at an oceanfront restaurant and grits were one of the side dish options. I instantly became a grits fan. For Alton’s grits, combine 2 C milk, 2 C water, and 1 1/2 t Kosher salt in a saucier and bring the mixture to a boil. Milk, water, and Kosher salt in a saucier. Once boiling, slowly whisk 1 C coarse cornmeal into the liquid. A cup of coarse cornmeal. Place a lid on the pan and cook the grits for 20-25 minutes, stirring every two or three minutes, and keeping the heat as low as possible. I found that my grits were still too thin after 25 minutes, so I cooked them for about 35 minutes. Grits after stirring/cooking for ~35 minutes. Stir in 4 T butter and season with Kosher salt, if needed. Lastly, slowly stir in 4 ounces of shredded cheddar cheese. Cheddar, slowly added to grits. We ate these grits for a pre-run breakfast, alongside purple barley bread and they kept me fueled for 8.5 miles. A bowl of cheese grits. These grits are cheese, rich, and creamy. Due to their richness, I could only eat a small bowl before I felt pretty full. Alton’s grits are definitely heavier than his version of polenta, but equally tasty. Lastly, Alton finishes this episode with a sweet pineapple upside-down cake. Although this cake has been around forever, this was my first time making a pineapple upside-down cake. To begin the cake, place 3/4 C whole milk in a microwave-safe bowl and microwave the milk until it is boiling. Sprinkle 1 C coarse cornmeal over the milk and let it sit. Coarse cornmeal to be added to boiling milk. 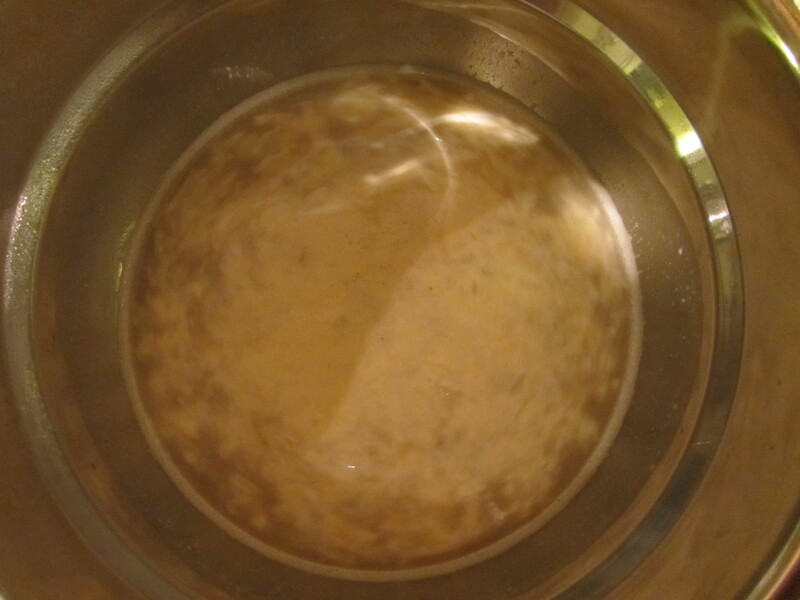 Coarse cornmeal added to boiling milk. Topping ingredients: butter, dark brown sugar, canned pineapple rings, toasted pecans, and maraschino cherries. Next, place a 10-inch cast iron skillet over medium heat and melt 4 ounces of unsalted butter in the pan. 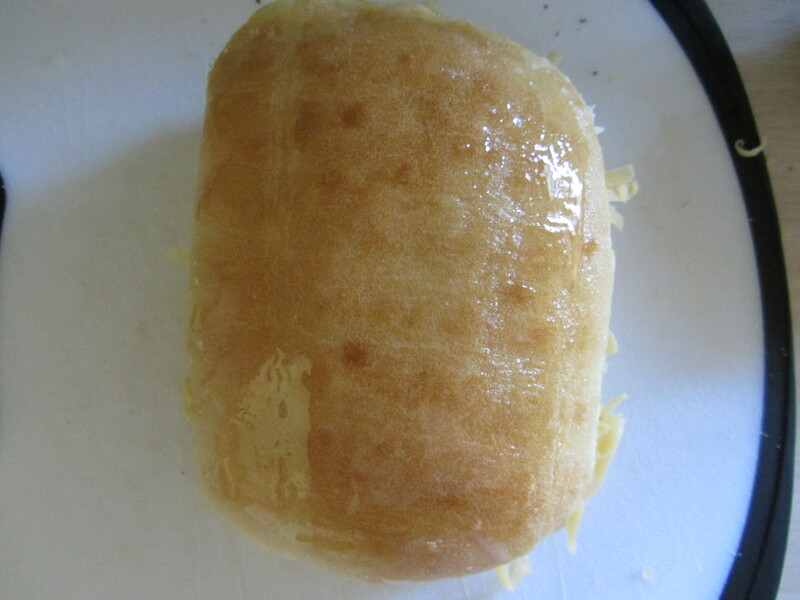 When the butter has melted, use a pastry brush to brush some of the butter up the sides of the pan. 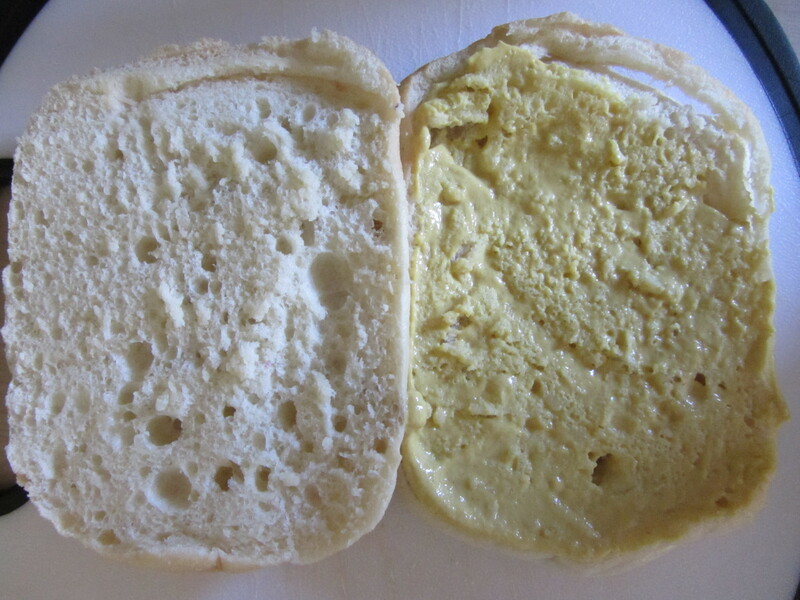 The butter will brown slightly. Melted butter brushed up sides of pan. Add 1 C dark brown sugar to the pan and stir until melted, which will take about five minutes; watch the sugar carefully, as it can easily burn. Brown sugar added to butter. Once the sugar has melted, remove the pan from the heat and place canned pineapple slices around the perimeter of the pan, and one additional ring in the center. Pineapple rings added to caramel. Put a maraschino cherry in the center of each pineapple slice and sprinkle 1/3 C of toasted/chopped pecans over the pineapple. Cherries placed in each pineapple ring. Toasted pecans sprinkled over pineapple. Drizzle on 3 T of the juice from the canned pineapple and set the skillet aside to cool slightly. Pineapple juice drizzled over topping. While the skillet cools, combine 4 3/4 ounces flour, 2 t baking powder, and 1/2 t salt in a large bowl. Flour, baking powder, and salt. In a medium bowl, whisk together 3 eggs, 3/4 C sugar, 1/2 C canola oil, and the milk-soaked cornmeal from earlier. Soaked cornmeal added to liquid ingredients. When the wet ingredients are combined, add the wet mixture to the dry ingredients and whisk for a count of six. The final batter will be a little lumpy, but that is okay. Do not over mix. Wet mixture added to dry ingredients. Pour the cornmeal batter over the pineapple in the skillet and place in a 350 degree oven for 40 minutes. Cornmeal batter poured over topping. Cake after baking for 40 minutes. Let the cake cool for 30 minutes before flipping the cake out of the skillet. Cut the cake into wedges and serve. Cooled cake flipped onto cake stand. This cake is fun to make because it looks pretty when you invert it out of the pan. The topping is a delicious mix of dark caramel, crunchy pecans, and juicy pineapple; the best part, in my opinion, is the part by the edges of the pan, as the caramel is thick and slightly chewy there. The batter of this cake has the slight grittiness of cornmeal, and is only slightly sweet. I like the fact that the cake itself is not overly sweet, as the topping is sweet enough. This cake is great for breakfast, dessert, or both! Though I had consumed cheese souffle when I was young, I had never made one before I set out to prepare Alton’s souffle for our Saturday breakfast. Per Alton’s instructions, I preheated my oven to 375, which is his temperature rule for any souffle. For a souffle vessel, he recommends a 1.5-quart round souffle dish, preferably with an unglazed bottom (for heat penetration) and fluted sides to increase surface area; it just so happens that we have a dish just like this. First, I greased my souffle dish with cold butter. Souffle dish, greased with cold butter. Next, I added 1 T of grated Parmesan to the dish, covering it with plastic wrap and shaking to coat the inside of the dish. I found that I actually needed a little more Parmesan to coat my dish, so I added some extra and shook again. Lining the dish with Parmesan gives the souffle something to “hold onto” as it climbs the walls. The souffle dish goes into the freezer while you prep everything else. Grated Parmesan added to buttered souffle dish. Souffle dish covered with plastic wrap and shaken to distribute Parmesan. Prepared souffle dish in freezer. Alton’s recipe then calls for making a roux by melting 1 1/2 ounces of butter over medium heat, allowing the butter to cook until it stops bubbling, which means most of the water has been cooked out. Butter, cooking until it stops bubbling. While the butter cooks, in a lidded container combine 3/4 ounce flour, 1 t dry mustard, 1/2 t garlic powder, and a heavy pinch of Kosher salt, shaking to combine. Kosher salt, dry mustard, and garlic powder. Kosher salt, dry mustard, and garlic powder added to flour. You will also want to separate 4 egg yolks (you will need 5 egg whites later, so save the whites here), grate 6 ounces of sharp Cheddar cheese, and heat 1 1/3 C milk in the microwave. Separated eggs. Need 4 egg yolks and 5 egg whites. When the butter has ceased bubbling, add the dry ingredients to the pan, whisking over low heat until you have a nutty aroma. 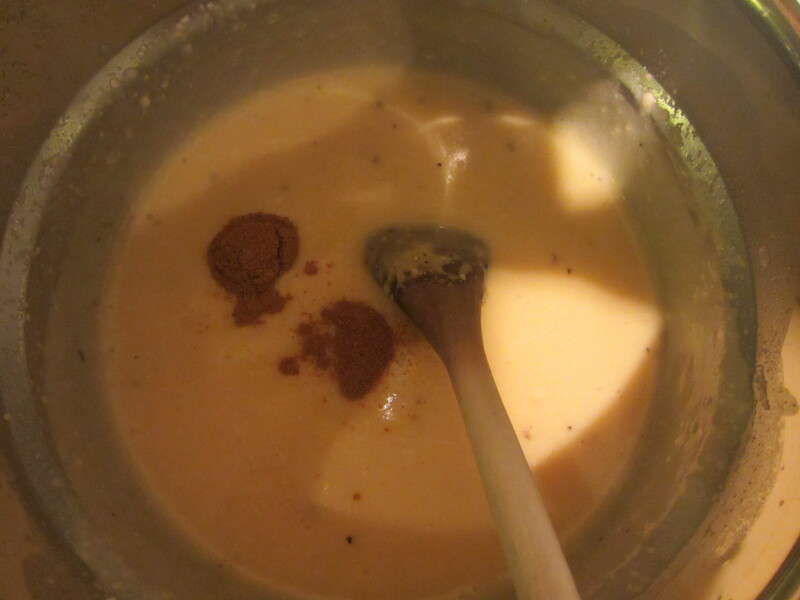 To the roux, add the hot milk, whisking and increasing the heat. Dry ingredients added to flour to form a roux. Beat your egg yolks until light in color and turn the heat off under the roux. Temper the egg yolks by gradually adding small amounts of the hot roux, whisking. Once you have added about half of your roux, you can whisk the egg yolks into the roux pan. Egg yolks beaten until light. Egg yolks, tempered by gradually adding some of the hot roux. Tempered egg yolks added to roux. Keeping the pan off of the heat, whisk in the grated Cheddar until you have a smooth mixture, which will take a few minutes. Set the base aside to cool. Note: To cut down on preparation time the day you are making your souffle, you can make the souffle base to this point and refrigerate it for up to a week; just be sure to press a layer of plastic wrap onto the surface to avoid having a “skin” form. If you do this, you will need to bring the base to room temperature before using. While your base cools to room temperature (or warms to room temperature if you prepared it in advance), beat 5 egg whites in a metal bowl, along with 1 T water and 1/8 t cream of tartar until you have stiff peaks. Five egg whites, along with 1 T water and 1/8 t cream of tartar. Egg whites, beaten until they have stiff peaks. Stir 1/4 of your egg whites into your room temperature base, as this will lighten the base. Stirring 1/4 of the egg whites into the souffle base. Gently fold the remaining whites into the base in three installments, avoiding deflating the foam by over-mixing. Folding in 1/3 of the remaining egg whites. Folding in the final 1/3 of the remaining egg whites. Pour the souffle into the prepared dish and use your thumb to make an indentation all around the edge of the souffle, as this will help to form a nice “top hat.” Place your souffle dish in a pie pan (for ease of removal from the oven), and bake it for 35 minutes. After 35 minutes, use a sharp paring knife to peek into the middle of the souffle – if there is a lot of liquid, place it back in the oven for 5 more minutes. My souffle seemed to be done after 35 minutes. Souffle after baking for 35 minutes. Serve your souffle promptly. The nice thing about a cheese souffle is that you could eat it for any meal, but we had ours for breakfast before an 11-mile run. Honestly, I was worried that my souffle was going to flop, as I felt that I had over-beaten my egg whites, but it actually turned out quite nicely. I do wish my souffle would have had a better rise above the top of the dish, but it still was nice and airy, and had a light crust on the outside. The cheese flavor was really prominent in this souffle and it had the texture of super light scrambled eggs. Souffles can be intimidating, but they are really not difficult, and Alton’s recipe seems to be one that works. Next up in my blog project was Alton’s recipe for baked macaroni and cheese. Last fall, Alton posted an updated version of this recipe on his web page, and I went ahead and made it, despite knowing it would be coming up later in my project. Yes, I usually try to wait to make the Good Eats recipes until their time arrives in sequence, but last fall was a rough time and I was searching for the highest calorie recipes I could find. Ted had lost 35 pounds from his skinny runner/cyclist frame, due to complications from cancer treatment, so I was on a mission to fatten him up. When Alton’s baked macaroni and cheese showed up in my Facebook feed, it was just perfect timing. Knowing this recipe was good, I was excited to make it again – this time for my blog. 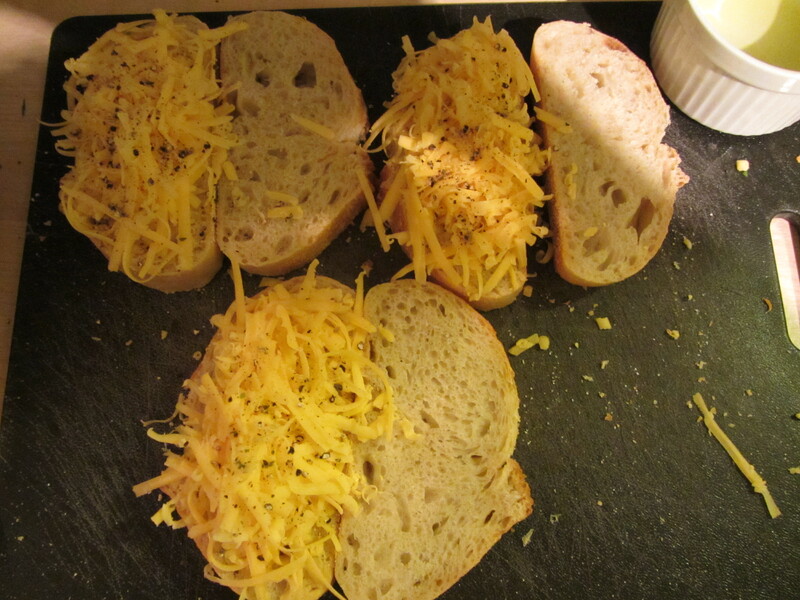 Cheese-wise, you will need 12 ounces of grated cheddar cheese for Alton’s recipe. 12 ounces of grated cheddar. Begin by cooking 1/2 pound of elbow macaroni in salted water for six minutes. Drain the pasta and rinse it with cold water to halt the cooking process. 1/2 pound of elbow macaroni, cooked for 6 minutes and rinsed under cold water. Next, melt 3 T butter in a pan over medium heat, and whisk in 3 T flour. Cook this mixture until it is sandy in color. 3 T flour added to 3 T melted butter. Roux cooked until sandy in color. Add 1 T powdered mustard, 1/2 t paprika (I used hot, smoked paprika), 1/2 C chopped onion, 1 bay leaf, and 1 t Kosher salt, whisking to incorporate. Powdered mustard, paprika, chopped onion, a bay leaf, and Kosher salt added to roux. 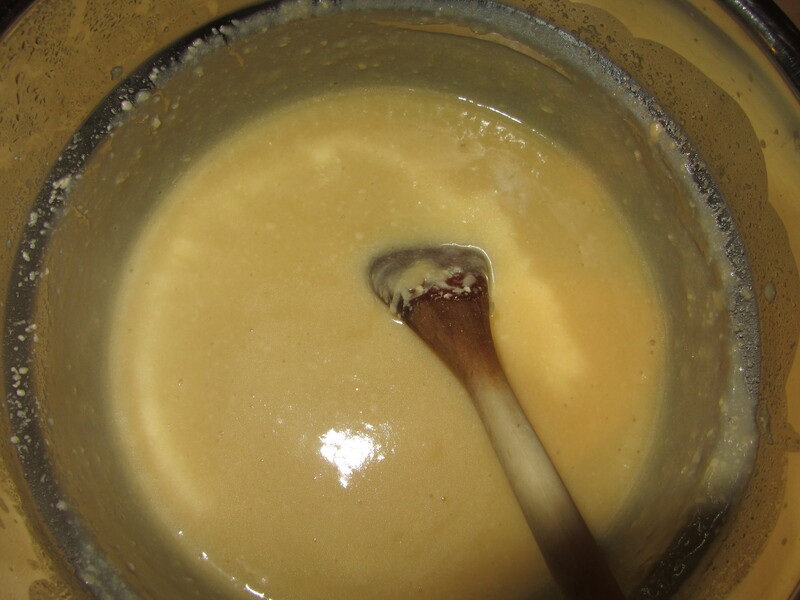 Roux, prior to adding milk. Slowly add in 3 C whole milk, whisking until thickened, which will take several minutes. 3 C milk to be added to roux. Discard bay leaf. In a small bowl, lightly beat one egg. Temper the egg by whisking in 2 T of the hot milk sauce. You can now add the egg to the pan of hot sauce and it will not curdle. 1 egg, to be lightly beaten and tempered. 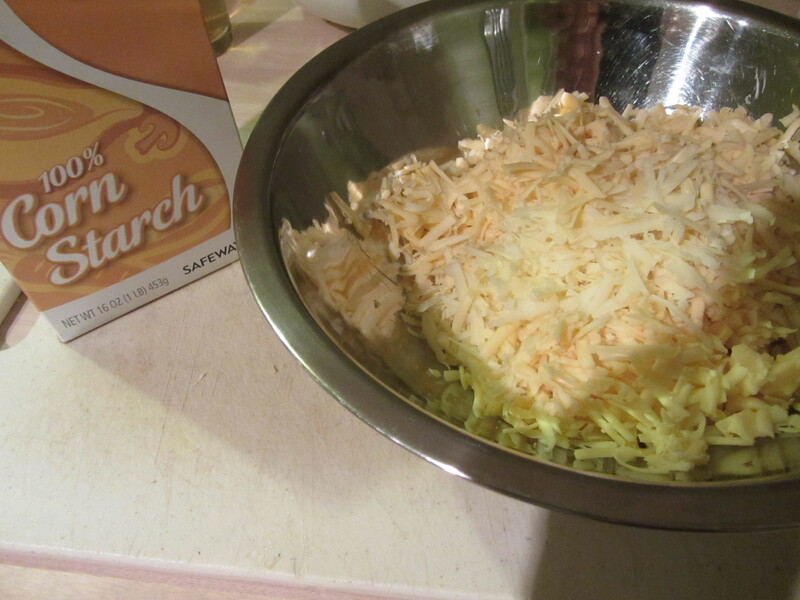 Whisk in 3/4 of the grated cheese until melted. 3/4 of cheese being added to sauce. Fold the cooked noodles into the cheese sauce and pour into a 2-quart casserole dish. Sprinkle the remaining grated cheese over the top of the casserole. Noodles folded into cheese sauce. Mac and cheese in casserole dish, with remaining cheese sprinkled over the top. Finally, combine 1 C panko bread crumbs with 4 T melted butter, and sprinkle the buttered crumbs evenly over the surface of the casserole. Bake the macaroni and cheese at 350 degrees for 30 minutes. Let the macaroni and cheese sit for a few minutes before serving. Buttered panko sprinkled over mac and cheese, and into the oven for 30 minutes. Mac and cheese after baking. Alton’s baked mac and cheese. As I said before, this macaroni and cheese is not low-cal, but it is quite delicious. While the noodles remain “toothsome,” the sauce is rich and cheesy with a little bite from the powdered mustard and paprika. The crispy panko topping is the icing on the… mac and cheese? For mac and cheese fans, this is a sure hit. As if one great macaroni and cheese recipe weren’t enough, Alton also has a stove top version of America’s greatest casserole. For this recipe, you will need eggs, evaporated milk, hot sauce, powdered mustard, Kosher salt, pepper, elbow macaroni, butter, and cheddar cheese. Ingredients for Alton’s stove top mac and cheese: pepper, hot sauce, powdered mustard, butter, eggs, cheddar cheese, elbow macaroni, evaporated milk, and Kosher salt. 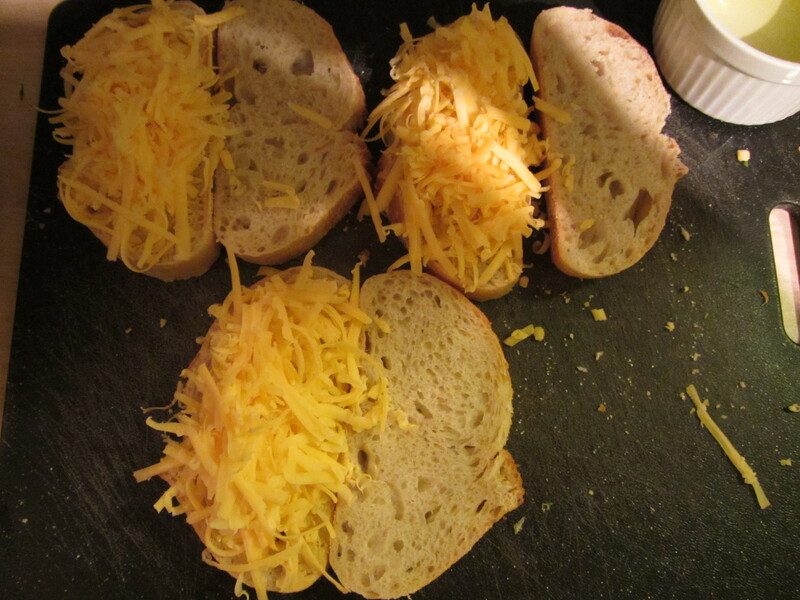 Begin by grating 10 ounces of cheddar cheese. 10 ounces of grated cheddar cheese. Next, whisk 2 eggs in a bowl and add 6 ounces of evaporated milk. Add 1/2 t hot sauce, 3/4 t powdered mustard, 1 t Kosher salt, and some pepper. 2 eggs, to be beaten. Evaporated milk added to eggs. Hot sauce, powdered mustard, Kosher salt, and pepper added to sauce. Set the sauce aside while you cook 1/2 pound of elbow macaroni in salted water until al dente. Drain the pasta and place it immediately back in the pan, stirring in 4 T butter until melted. Butter added to hot elbow macaroni. On a low burner, add the egg mixture to the noodles, along with the grated cheddar cheese. Cook and stir until the sauce is smooth. Alton’s stove top mac and cheese. Honestly, we thought this mac and cheese was great, especially for the time and effort required. I actually thought this recipe had stronger cheese flavor than Alton’s baked version. I did, however, miss the crispy panko topping. Next time I make mac and cheese, I think I will opt for this version because it is easier, faster, and on par with Alton’s baked recipe – I just might add some buttered, toasted panko to the top. I will be making this again for sure. In case macaroni and cheese was not sinful enough, Alton decided to make it that much richer with this recipe for fried macaroni and cheese. I made this with leftovers from Alton’s baked macaroni and cheese. Begin by combining 1 C flour, 1 t salt, and 1 t cayenne pepper. Slice your cold leftover macaroni and cheese into individual servings and coat each piece in the flour mixture. Next, dunk each piece in beaten egg. Finally, dip each slice in panko bread crumbs. Slices of mac and cheese. Three stages of batter: flour mixture, egg, and panko. Stage 1: into the flour mixture. Stage 2: into the egg. Stage 3: into the panko. Coated slices of mac and cheese. While you are preparing your macaroni and cheese, heat peanut oil to 375 degrees on the stove. When the oil has reached its temperature, fry the macaroni and cheese slices until golden brown and crispy. Slices of mac and cheese, frying in peanut oil. Crispy fried crust on mac and cheese. Sprinkle the slices with Kosher salt and hot sauce before serving. Alton’s fried macaroni and cheese. This was delicious. The already wonderful, cheesy, rich macaroni and cheese was enhanced with a golden, crispy fried crust all around. If you have leftover macaroni and cheese, frying it makes an extra special treat, and who couldn’t use a treat now and then? Now that the fruitcake has officially all been eaten in our house, we’re on to the next logical task: cheese! Cheese is absolutely one of my favorite things, and I will find any excuse to eat it. I have been known to reason that I need to eat more cheese because “I need more protein,” or because “Calcium is good for my bones.” I can also safely say that I like any and all types of cheeses. Well, except for Gjetost. I just can’t do Gjetost. Thank goodness my HDL is 119. The first recipe Alton conquers in this episode of Good Eats is for cheese fondue. I will confess that I had made this fondue before, though I had not watched the episode prior to making the recipe. I did watch the episode before making it this time around. 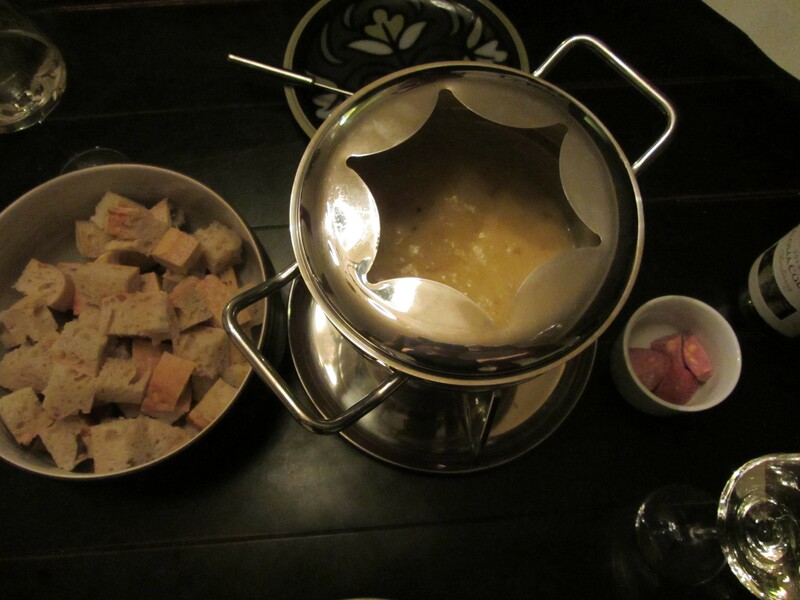 My family ate cheese fondue when I was growing up, especially when we went downhill skiing in the winter. I remember that my mom’s recipe always had a touch of Kirsch in it. Alton’s recipe also uses some alcohol, though his is in the form of hard cider and brandy. To begin Alton’s recipe, you rub your fondue pot with a halved clove of garlic. 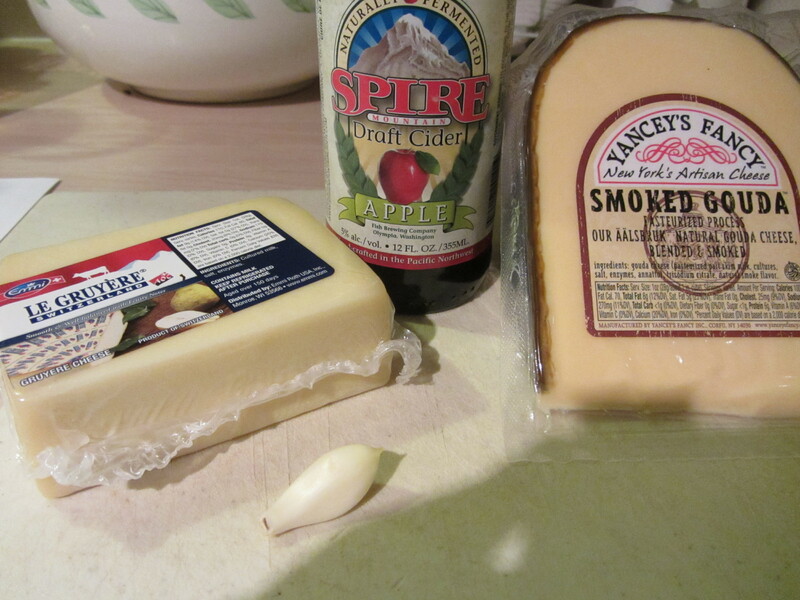 Garlic, hard cider, Gruyere, and Smoked Gouda. Alton recommends using an electric fondue pot, but we do not have one, so I used a standard fondue pot. 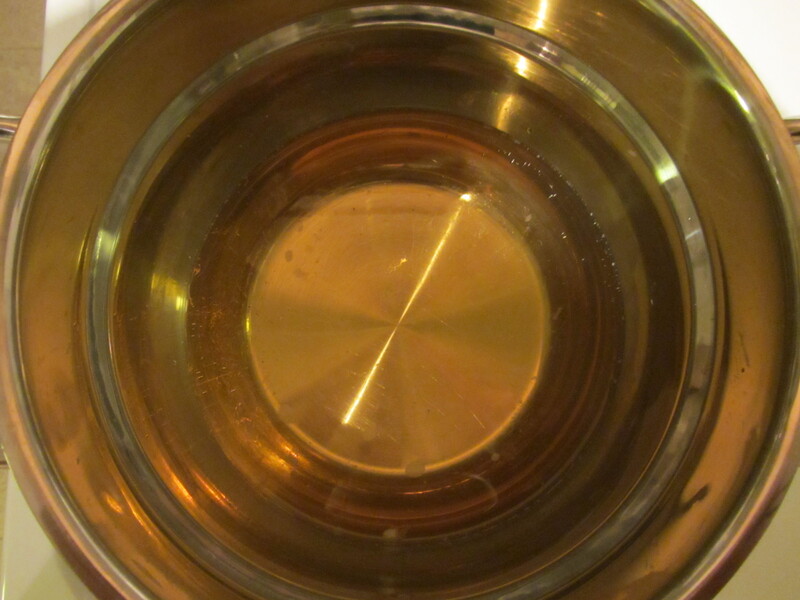 Once you have thoroughly rubbed your fondue pot with garlic, you add hard cider, Kosher salt, lemon juice (Alton uses 1 T in the episode, while the online recipe calls for 2 T), and brandy. You bring this mixture to a simmer. Pot rubbed with garlic and filled with hard cider, Kosher salt, lemon juice, and brandy. Meanwhile, you grate your Gruyere and Smoked Gouda, and toss the cheeses with 2 T of cornstarch (the online recipe calls for less cornstarch). 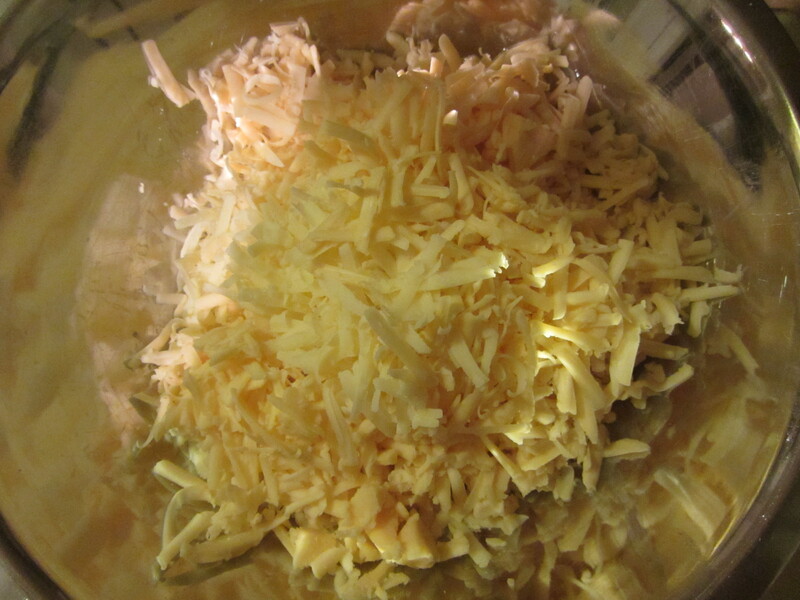 Grated Gruyere and Smoked Gouda. 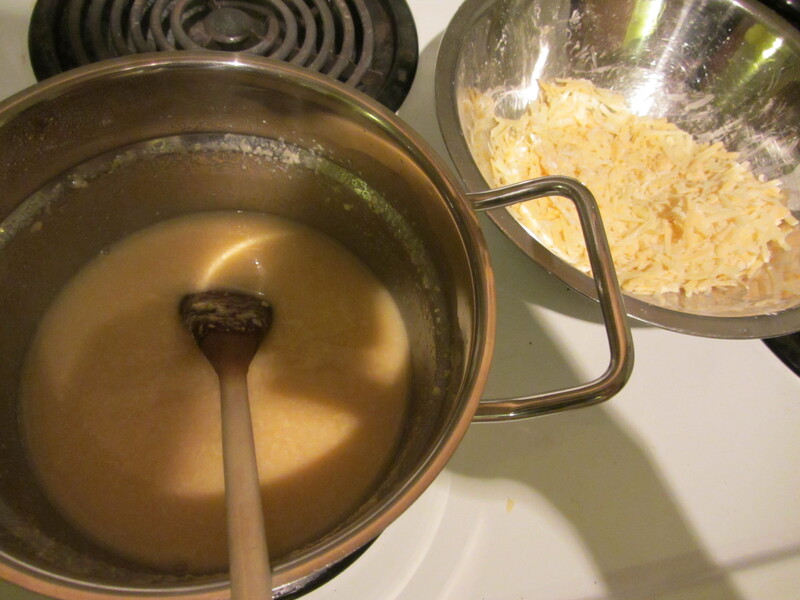 Gradually, handful by handful, you begin adding your grated cheese to the cider mixture. Adding the first handful of cheese. Alton stresses that you take this process slowly, allowing the cheese to melt completely and waiting for bubbles to break the surface before adding the next handful of cheese. 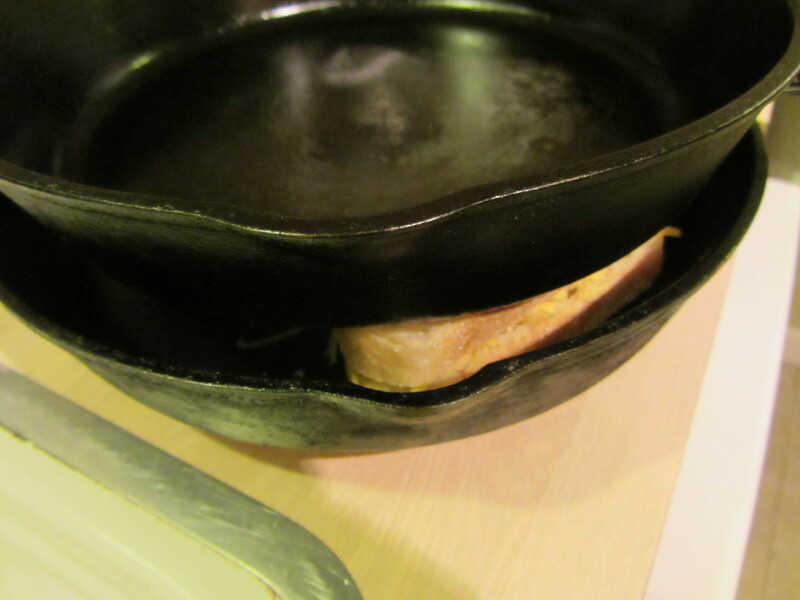 I found that I actually needed to increase the heat a bit to get the cheese to completely melt and incorporate. Otherwise, little bits of cheese remained visible. Adding cheese, handful by handful. All of the cheese incorporated. Once the cheese is all melted and smooth, you add a pinch of black pepper and 1/2 t (the online recipe calls for 1/4 t) of curry powder. 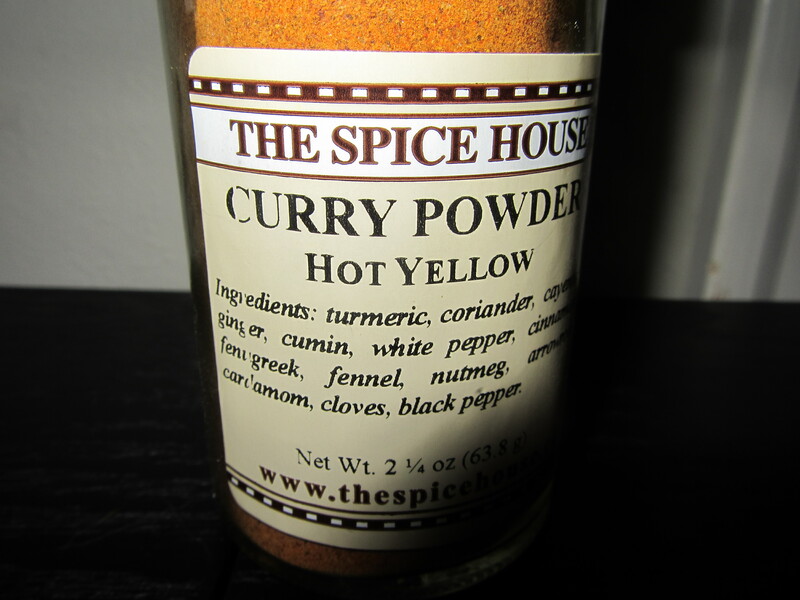 Since we like heat, I chose to use hot curry powder. We ate our fondue with cubed bread and a little bit of cubed Summer sausage. When we have had fondue in the past, we have also really liked to use apples or pears, though we did not do that this time around. We both really like the flavor of this fondue, which is why we have made it a few times now. My fondue ended up being much smoother this time around, which I assume could be due to the additional cornstarch in the episode recipe vs. the online recipe. The smokiness of the Gouda really comes through in this fondue, though it is not overpowering, and the sweetness of the cider is also evident. I find the flavors to balance well, with the sweetness of the cider, the smokiness of the Gouda, the subtle heat from the curry powder, the tartness of the lemon juice, and the salty/nutty flavor of the Gruyere. This is a super easy, but sinful, dinner to make. We like to have it on a day when we have done a good long run or bike ride! This will remain my go-to cheese fondue recipe, and I’ll be making it as Alton makes it in the episode. The second recipe in the cheese episode is for a grilled cheese sandwich. Being the cheese lover I am, I’m a pretty happy girl if you put a grilled cheese sandwich in front of me, especially if the bread and cheese do the sandwich justice. For his sandwich, Alton tells you to heat two skillets (preferably iron) over high heat. 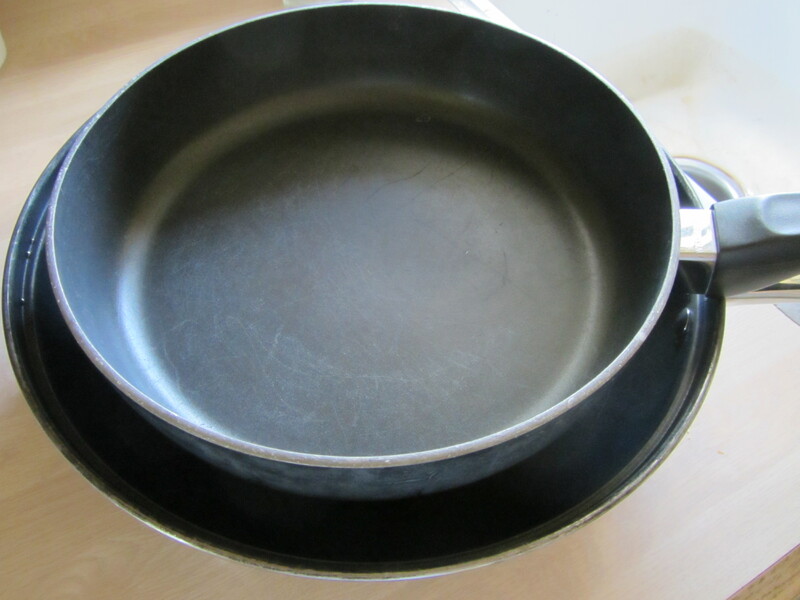 Ideally, you want one skillet to be able to nest inside the other skillet. We happen to have two iron skillets that fit the bill perfectly. 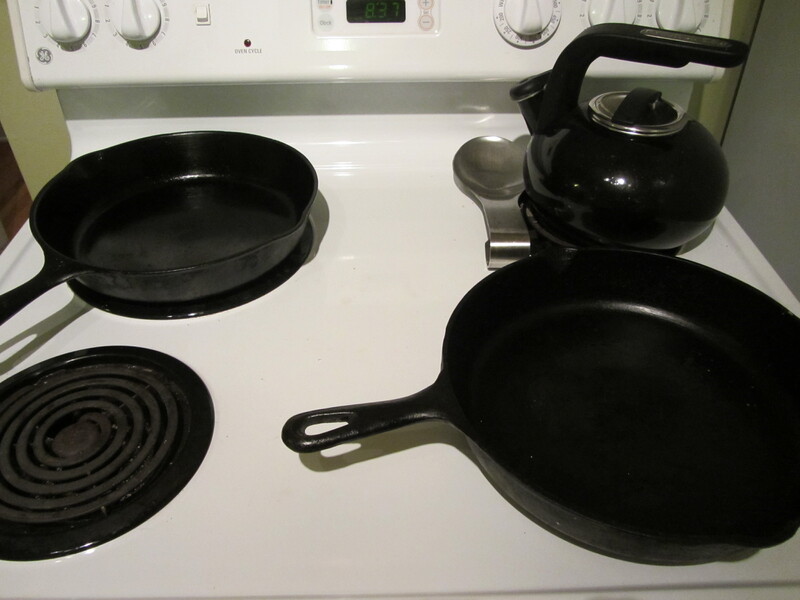 Heating two cast iron skillets. While your skillets heat, you grate a good handful of cheese (Alton uses Cheddar in the episode, so that is what I used) and spread Dijon mustard on one slice of bread. 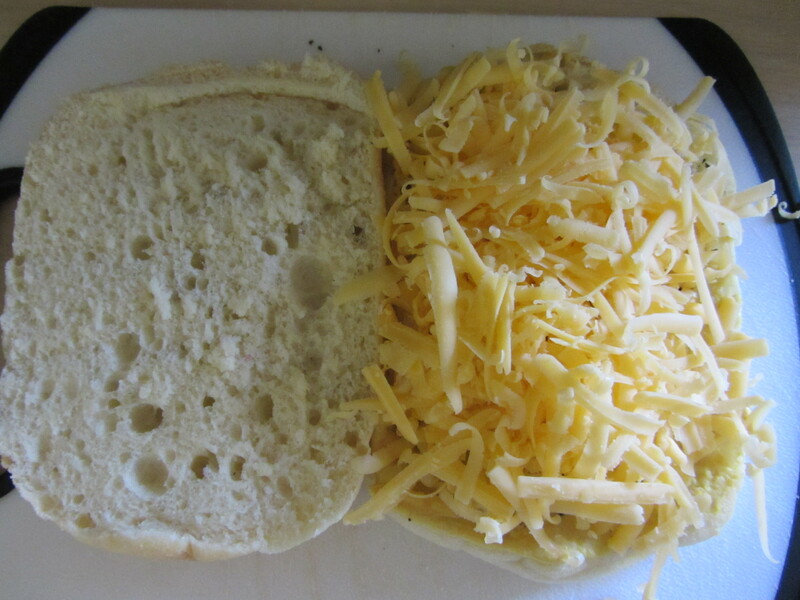 You top this with the cheese, grind some black pepper on top, and put the lid on your sandwich. 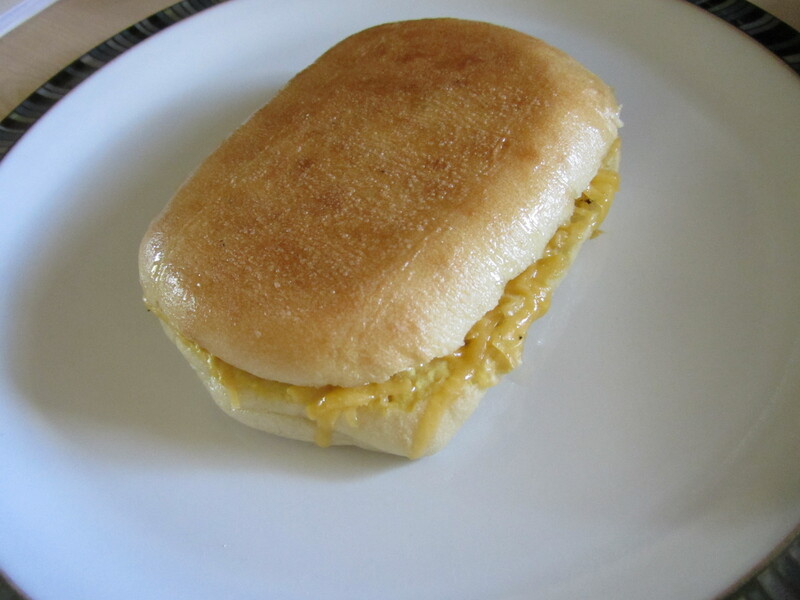 Cheese on the mustard-coated bread. 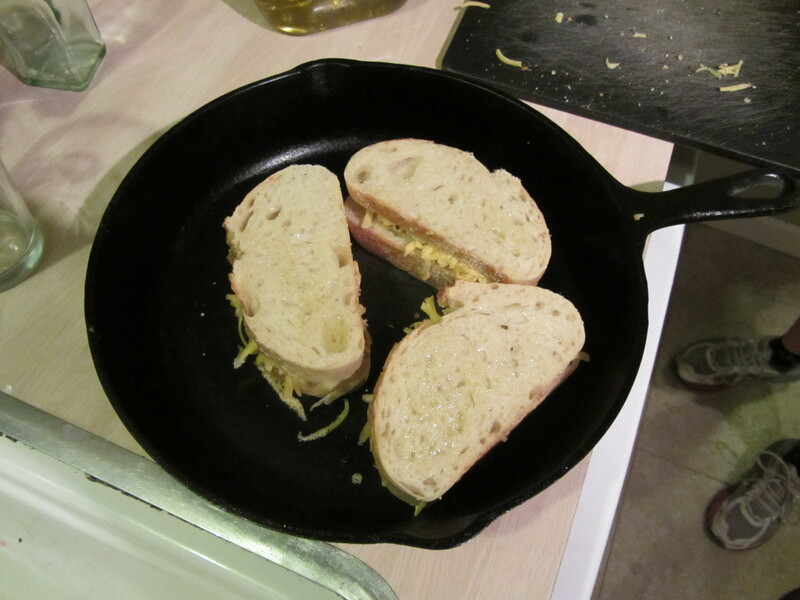 You then spritz olive oil onto the outer sides of the sandwich and onto the bottom of the smaller skillet. 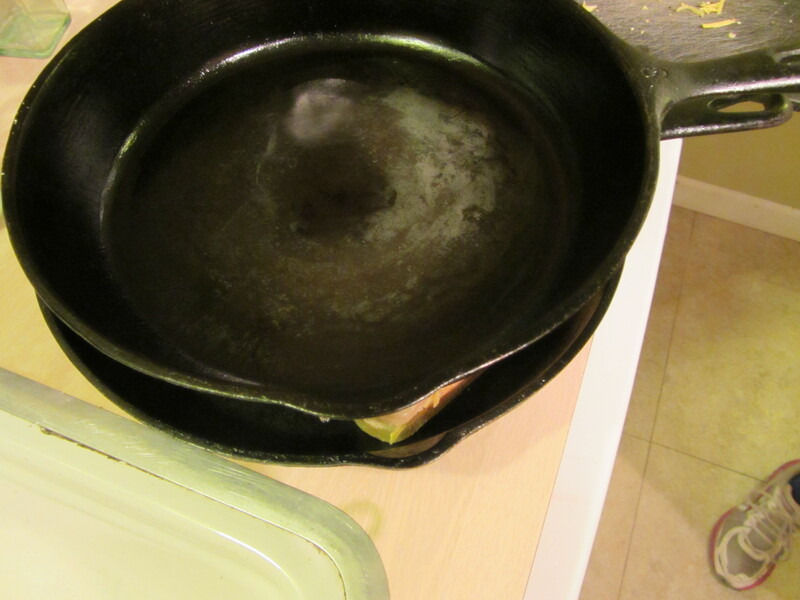 You remove the pans from the heat, place your sandwich in the larger skillet, and put the smaller skillet on top. In about three minutes, you should have the perfect grilled cheese sandwich. Into the skillet, after being coated with olive oil. I have liked all of the recipes that I have prepared from Good Eats… until now. This recipe was just a complete flop for me. My skillets ended up being way too hot, and quickly burned the outside of my sandwich, and I did not actually turn the heat on under the skillets until I was completely ready to assemble my sandwich. I ended up throwing my sandwich away. 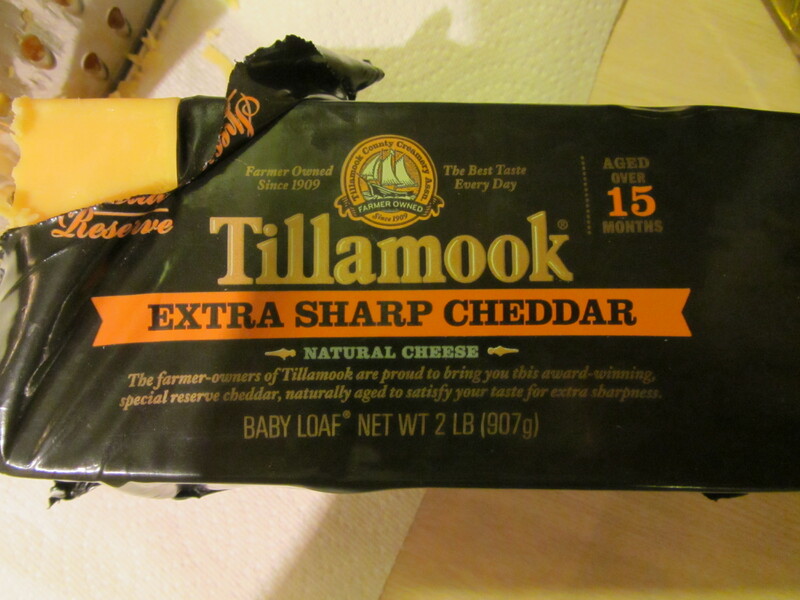 Frustrated, and irritated to waste aged extra sharp Cheddar cheese, I opted to wait to try again another day. I tried this method again a few days later, opting for non-stick skillets this time, and heating them over lower heat for less time. 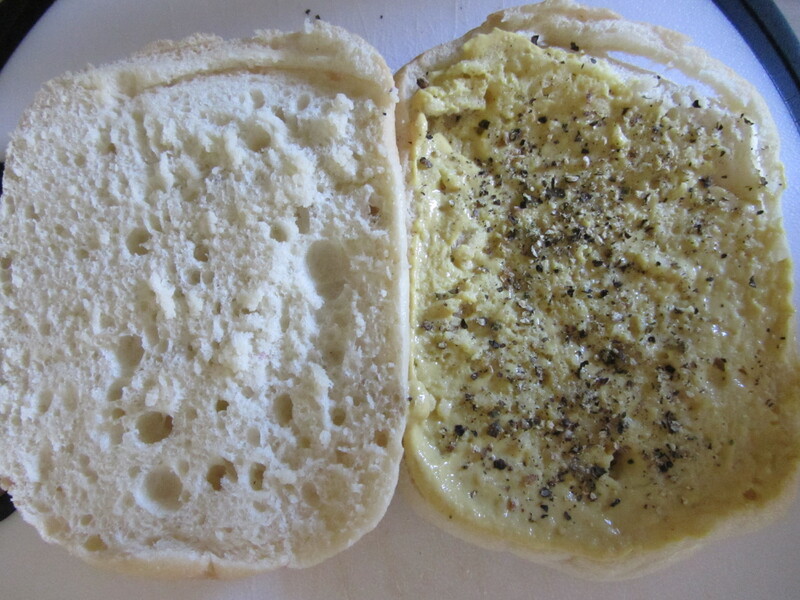 Bread with mustard and pepper. 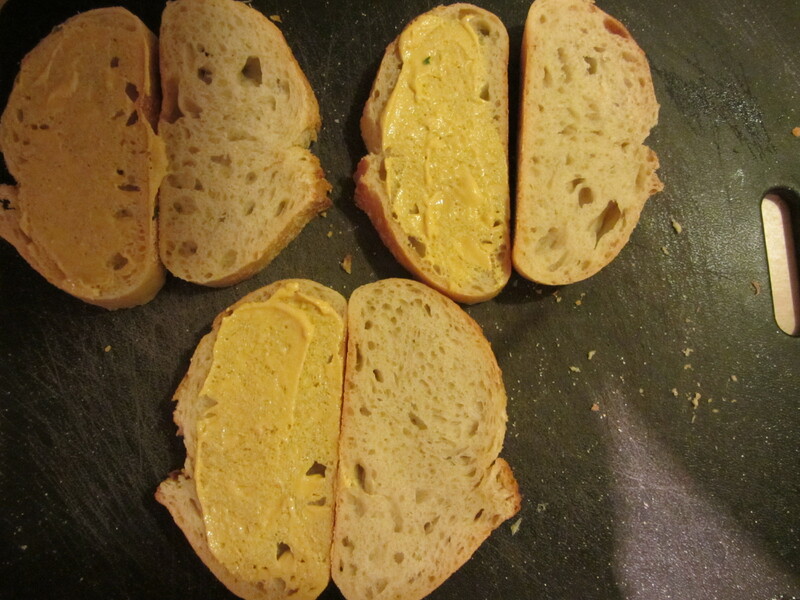 Bread with mustard, pepper, and cheese. Guess what? This time, the skillets were not hot enough, so the outside of the sandwich got slightly browned, but the cheese was not thoroughly melted. Great. Sandwich from skillets that were not hot enough. I had to place them back over the heat and do it a second time. And, in that amount of time, I could have already eaten a perfectly good grilled cheese sandwich made the old-fashioned way. I will say that I liked the sandwich made with Dijon mustard and black pepper, though I had discovered that I liked the addition of mustard on my own a while ago. I will not be making a grilled cheese sandwich this way again. There is a reason that people have been making grilled cheese sandwiches the same way for years – because it works.